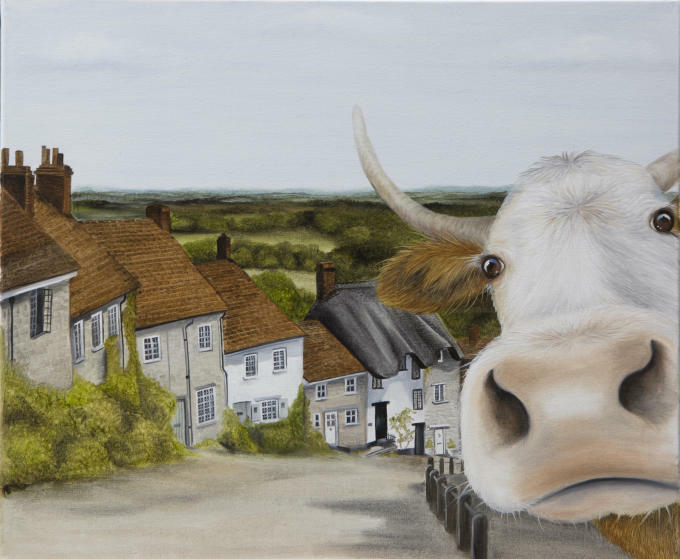 One of Lucy's Original, signed, paintings from the Moo Selfie Series, this one featuring the iconic Gold Hill, or as some may know it as the 'Hovis Hill' in Shaftesbury, Dorset, and a rather curious Hereford Cow peering in to the picture. Lucy's paintings certainly have a humorous style and will guarantee to bring a smile! The painting is done using oils on canvas and is approx 50 x 60cm, the canvas is stretched on to a wooden frame and can be hung straight away.